The award-winning advocacy film “Ang Araw sa Likod Mo” (also known as "The Sun Behind You") is finally getting a nationwide release next month. Written and directed by Dominic P. Nuesa, the film is about heroism, redemption, and sacrifice in the decades-old war between Filipino soldiers and Islamist radicals in the southern portion of the country. "Ang Araw sa Likod Mo” has been nominated in the upcoming Nice International Awards 2017 categories such as Best Director, Best Lead Actor, Best Supporting Actor, Best Editing, and Best Sound. While it has already won five international awards namely: – Best Film in Auckland International Film Festival, Global Award Winner at the ARFF (Around Films International Film Festival), and Awards of Recognition for Feature Length, Best Actor and Best Supporting Actor at the Accolade Global Film Competition. 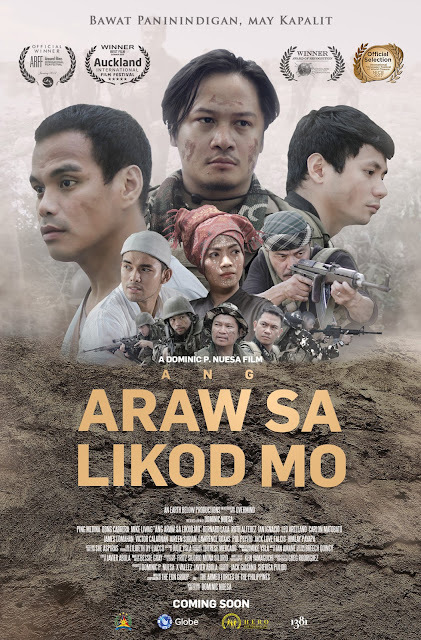 Inspired by the real stories of Special Operations soldiers in the country known as the Philippine Scout Rangers, “Ang Araw sa Likod Mo” is an intense film filled with raw action that introduces brothers Jamiluddin (Bong Cabrera) and Omar (Mike Liwag) along with Sgt. Benjie Calayan (Ping Medina) within the terrorist infested island in Southern Philippines. Opening in local theaters nationwide this May 24, majority of the proceeds from the box-office receipts of “Ang Araw sa Likod Mo” will be donated to Help Educate and Rear Orphans (HERO) Foundation, Inc. The foundation aims to uplift the families of soldiers from the Armed Forces of the Philippines who were killed or incapacitated in the line of duty by providing educational assistance to their children to obtain a college degree or vocational course.